The front serves up HDMI and USB ports, which is great for VR, but there are no audio jacks. At the rear you’ll find three USB 3 ports, a Type-C connection, a pair of DisplayPort connectors and another HDMI jack. There’s a PS/2 port for legacy peripherals, and the Ethernet and some USB ports are helpfully illuminated. 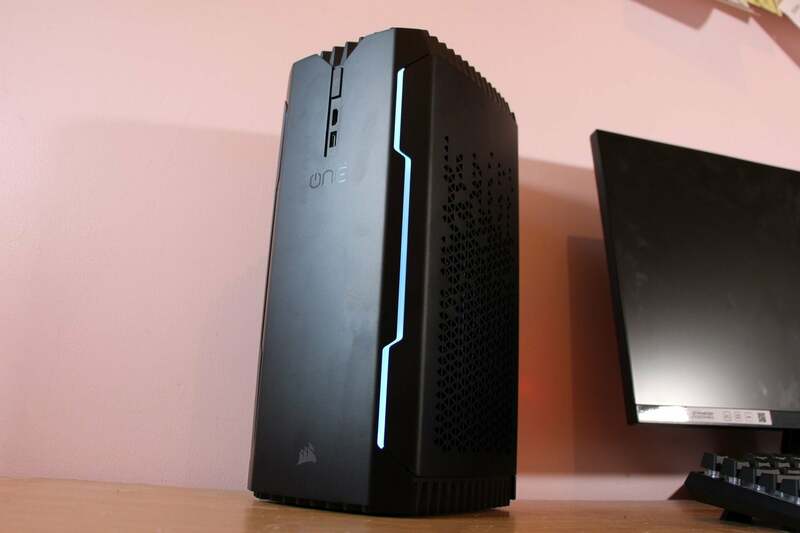 The Corsair One Elite can easily fit into an office, a gaming room or beside the TV. It’s a sturdy bit of kit, too, with no movement in the metal and a supremely robust set of slats on top of the machine. Those slats are the key to the Corsair. The metal dissipates heat, and this part of the machine holds a beefy exhaust 140mm fan that Corsair claims is almost frictionless. Prodding a discreet button removes the slatted covering and the fan – and reveals the Corsair’s ingenious innards. Beneath the slats you’ll catch sight of the power supply and the GPU outputs, but you’ll never interact with these; Corsair has used extension cables to provide accessibility to these ports from elsewhere. Instead, you can get inside by removing pairs of screws on either side of this top section. Removing one side reveals a long, thin water-cooling radiator and two short pipes that head to the processor. The waterblock is a standard model secured with four thumbscrews, and the LGA 1151 socket sits on a mini-ITX motherboard that’s buried deep inside the machine. The motherboard is a tweaked version of MSI’s Gaming Pro Carbon AC, which includes dual-band 802.11ac wireless, beefed-up audio circuits and an M.2 connector. The other side panel has a similar radiator that connects to the full-size graphics card. It sits behind the motherboard and hooks up with the motherboard’s PCI Express slot using a neat extension card. 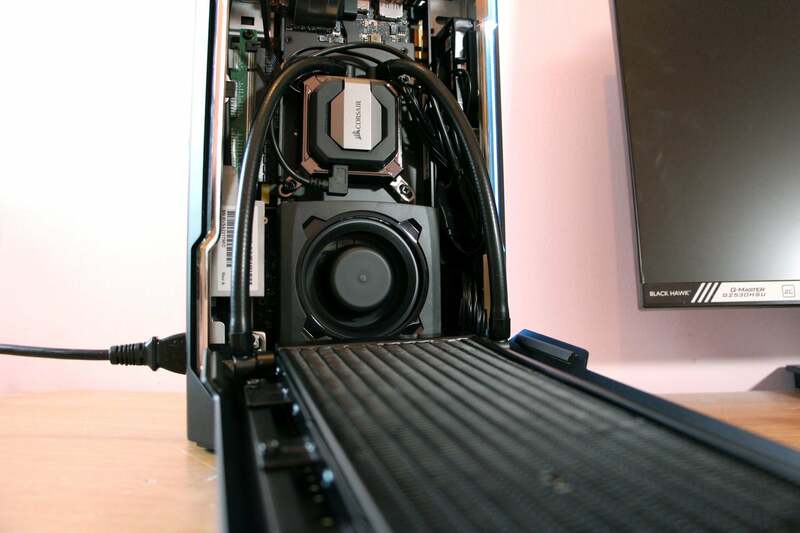 The water-cooling block sits alongside a secondary fan that cools the graphics memory chips. 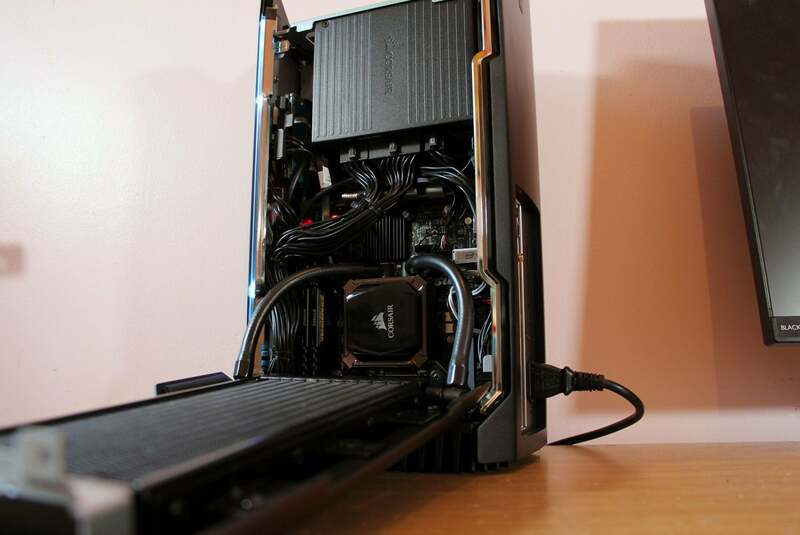 The Corsair’s two smaller side panels can’t be easily removed, and the entire rig is built around a rock-solid metal skeleton. It’s a brilliant design, and it’s the only way to cram so much power into such a tiny space. It does have its downsides, however. It’s difficult to reach the graphics card and CPU beneath all that hardware. The memory sticks are hidden beneath a load of cables, the hard disk is slotted down one side, and the M.2 SSD sits beneath a heatsink. The interior is dominated by cables, which is hardly a surprise, but it doesn’t make for easy access – even if I do like the modular PSU and its 80Plus Gold rating. However, this is a tiny niggle that won’t impact most people – the vast majority of users simply won’t be delving inside the Corsair. And while it’s certainly fiddly to do so, the major components remain within reach if you do need access. There isn’t a PC on the market that offers this much power inside such a tiny space – but, understandably, the tricky internal access and total lack of upgrade room will put off those who like to tinker. If that’s you, then you’d be better served by a conventional tower machine or mini-ITX rig. 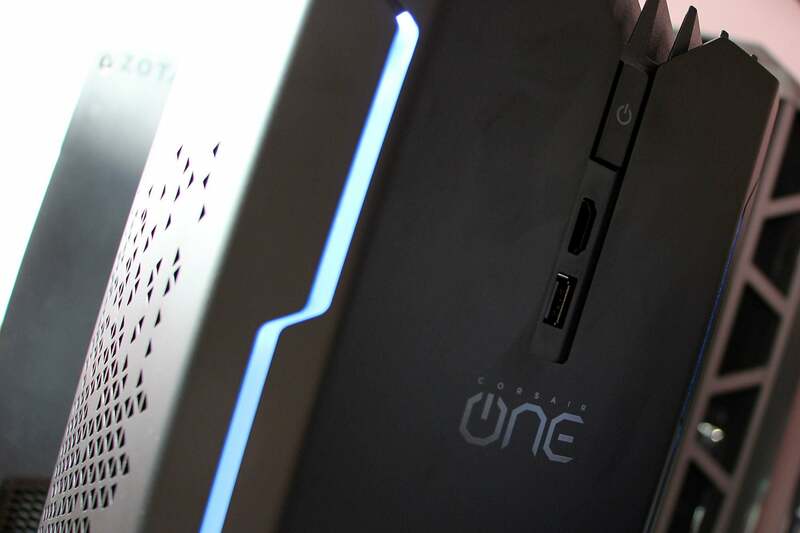 The Corsair One Elite’s design may not have changed physically, but the internals have certainly received a boost. The biggest upgrade is in the processing department. The older model’s i7-7700K has been swapped out for an i7-8700K. The new chip uses Coffee Lake, which means architectural upgrades – and, most importantly, two extra cores. The older chip could handle eight concurrent threads from four cores, but the six-core i7-8700K runs 12 threads at once. That’s a huge boost to multi-tasking, so it’s hardly a surprise that Corsair is pitching this machine at creatives as well as gamers. The six-core processor will do a better job than its predecessor at tasks such as photo editing, video work, streaming and other top-end productivity functions. There isn’t much in this space it won’t handle. Clock speeds remain competitive, too. The i7-8700K has a stock speed of 3.7GHz and a Turbo peak of 4.3GHz across all six cores and 4.7GHz on one core. The i7-7700K started at 4.2GHz, but its Turbo speeds jumped between 4.4GHz and 4.5GHz. That bodes well for gaming – which benefits from single-threaded speed – and more conventional work applications. The evidence for Coffee Lake’s effectiveness can be found in the benchmarks. The relatively stable clock speeds mean the Geekbench single-core result remains at an excellent 5365, and it scored 23,290 in the multi-threaded tests – around 4000 points better than last year’s i7-7700K. It’s also noticeably ahead of a Ryzen 7 1800X. In addition, the Corsair’s PCMark 8 result of 5524 is one of the best I’ve ever seen. It ran the POV-Ray video encoding benchmark and returned a score of 2846, and it scored 1392cb in the Cinebench multi-threaded test. Both those results are significantly quicker than the i7-7700K, but a little slower than the Ryzen 7 1800X that has two more cores than the Intel. This is no surprise given their multi-threaded nature. The AMD chip remains better for high-end workloads, but the Core i7 is hardly slow – the Intel chip requires less electricity, so it’s likely that it just isn’t possible to build a machine such as the Corsair One with AMD Ryzen right now. Storage, too, has received a boost. Last year’s model had a middling SATA 3 SSD, but this year’s rig includes a Samsung PM961 M.2 drive. Its read and write scores of 3186MB/sec and 1506MB/sec are excellent, and mean that the Corsair One Elite is unlikely to ever feel unresponsive. I’d have preferred to see a Samsung 960 EVO drive, however, since they’re a little quicker. It’s a similar story with the memory: there are no real issues with 32GB of 2666MHz, but 3000MHz DDR4 would have been more fitting. 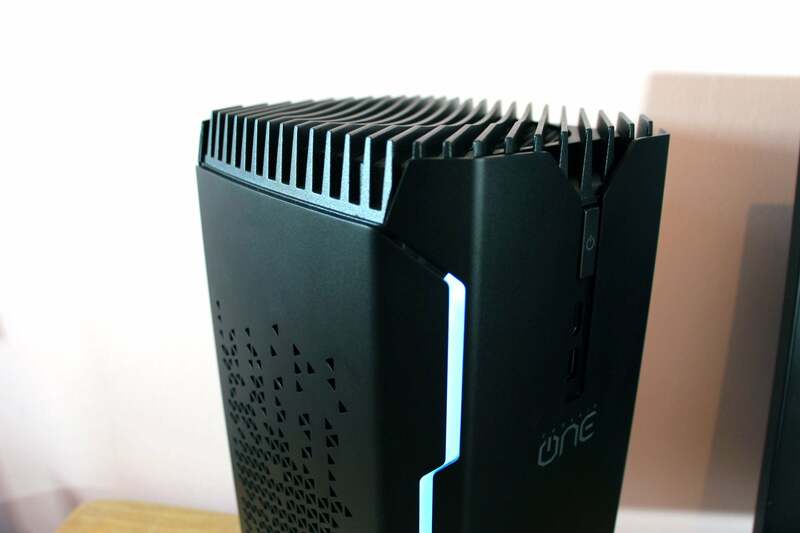 I’ve reviewed the top-end model of the Corsair One, which boasts a GeForce GTX 1080 Ti graphics card. This is one of Nvidia’s best consumer chips, with 11GB of GDDR5X memory, 3584 stream processors, and a base clock speed of 1480MHz that rockets up to 1645MHz. I’ve have no doubts about the Corsair’s gaming performance. It blitzed every 1080p test at more than 100fps. The Corsair On Elite will run games smoothly all the way to 4K. It handled Rise of the Tomb Raider at maximum settings with a stonking average of 68fps, and played Middle-earth: Shadow of Mordor at 88fps. It even handled demanding games such as Witcher 3 and Deus Ex: Mankind Divided; in the former it averaged 61fps and in the latter it hit 41fps. That doesn’t just bode well for 4K. The Corsair will run VR headsets smoothly, too, plus it has the grunt to handle streaming, video production and CAD design. Thermal performance remains superb. When it’s idling or running less-intensive tasks, the Corsair One Elite is hardly audible at all. I measured it at 31db; you just won’t notice this PC in a living room or office. The PC continues to impress in this regard in gaming. In tests, a peak noise level of 46db remains quieter than almost every gaming PC on the market. You’ll have to put your ear close to the chassis to hear the fan at all, and headset or speakers will easily block it out. Throughout the test the GPU ran at a consistent 1900MHz, with the CPU hovering around 4.5GHz. A full-system stress-test saw barely any difference. The noise level rose to around 50db, which is still a superb result that means the Corsair is quieter than every rival. The GPU speeds remained unchanged, and the CPU’s six cores ran at around 4.3GHz. There were no problems with temperature either. The CPU peaked at 87°C, with the GPU reaching 59°C. 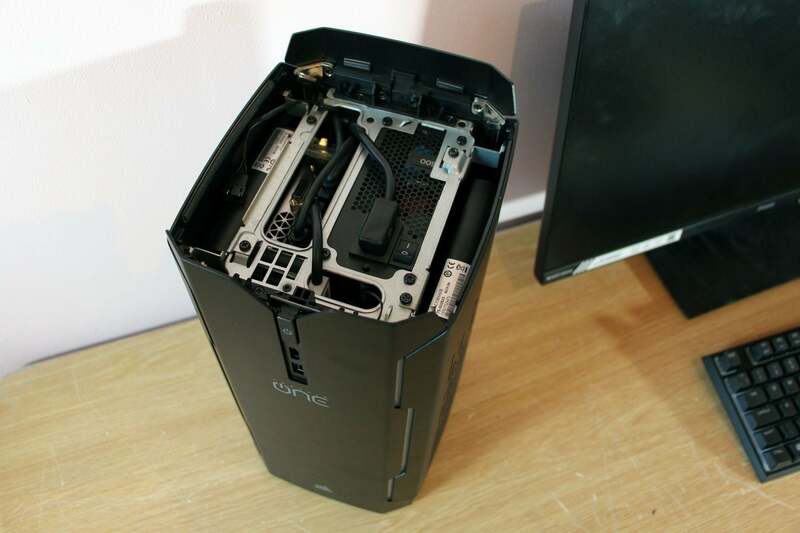 Hot air is ejected from the top of the case, which is worth remembering when you position this PC. All of those temperatures can be managed in the Corsair Link app, which also serves up fan speeds. The front LEDs can be changed to use a breathing pattern, and brightness levels can be altered. They can be turned off, too, but they’re not RGB – so, disappointingly, you can’t change the colour. While I reviewed the Elite, which is the priciest model in this revised range, cheaper rigs are available. The Corsair One Pro Plus halves the memory allocation to reduce the price to £2549, while retaining the rest of the components lineup. That will be the best option for most people, because only a handful of content creators will truly need this rig’s 32GB of DDR4. Last year’s model – sporting the i7-7700K and GTX 1080 – has been reduced to £2099, and its memory can be doubled to 32GB for an overall price of £2299. Those prices do still sting, especially if you’re looking at the Coffee Lake models. You can build your own mini-ITX machine with a similar specification for hundreds of pounds less – and opting for a traditional ATX tower can drop the price below £2000. Both options are less elegant, but they won’t leave such a hole in your pocket. Or, why not head to a local PC builder? Even with their profit margins considered, a more conventional system will deliver this level of performance for a big saving. Why buy the Corsair One Elite? 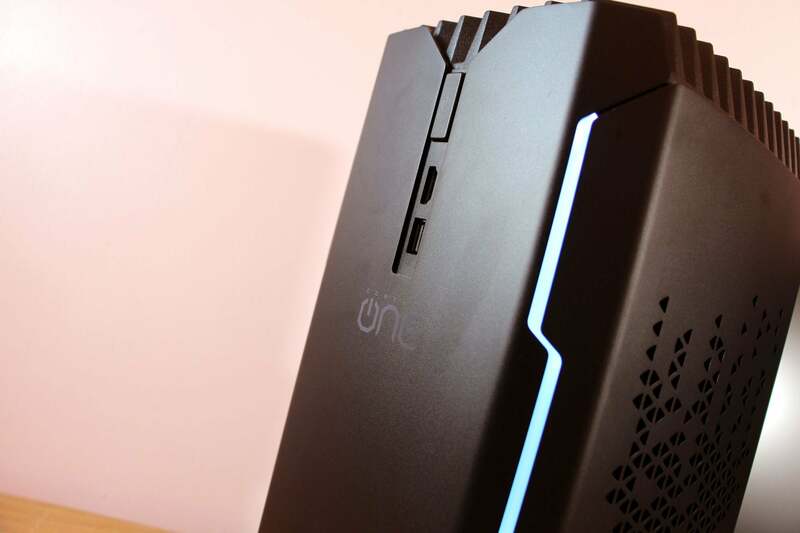 The Corsair One Elite is expensive, but it justifies its price in numerous important ways. There’s nothing else on the market that delivers this level of performance in such a compact form factor. The power available from the upgraded internals will be sufficient to handle any game at 4K or on a VR headset, and almost any creative or business tool. And, impressively, the Corsair swats aside games and tough applications while producing less noise than almost any gaming PC or office workstation. The cramped, innovative design remains impressive and inaccessible in equal measure – but this is unlikely to put-off folk who want a compact all-rounder for the office, living room or gaming den. If you are fussed then a more conventional system will offer up greater opportunities for upgrading and tweaking, and will save you some cash. But they’ll also be louder and larger. Corsair’s flagship PC was already great, and it’s even better now thanks to an injection of powerful, updated components. It’s pricey, but it justifies it by serving up form and function in one brilliant package.